DESCRIPTION: Park like property perfect for a mini farm. Electric is adjacent to site. Owner Financing Available!! DRIVING DIRECTIONS: Sterling Highway south to aprox. MP 110, turn on Johnson Lake Road, to Cabin Avenue, then right on Lichen Street. Turn left on Reggies Avenue. 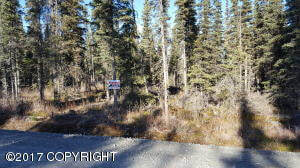 Look for real estate sign.